Anne and Alex arrived in Bhaktapur on Sunday afternoon. We were delighted to meet the girls in the Unatti Girls Home and were welcomed with a thoughtful and beautiful collection of cards – hand made and drawn by the girls in anticipation of our visit. After introducing ourselves, we shared some songs together. We went upstairs to the roof space where I (Alex) showed them a few clown and mime routines. We were delighted at their response and looked forward to returning later in the week. We left late afternoon to a chorus of ‘goodbyes’ ringing out into the street from the upper rooms of the house. It was a wonderful introduction to the Unatti Foundation. After finding out way through the intriguing streets of old Bhaktapur, we arrived at the Art and Music Centre to be greeted by about 30 disadvantaged children waiting in anticipation. Alex opened our week-long program with some mime and group developing games and Anne continued with a drawing project using ideas of body movement and animation. Over the course of the week, Alex taught many mime and clowning routines that emphasised the need to use the imagination and focus. These skits also develop skills in working co-operatively together, though the mime and clowning itself, but also in expectation that children watch each other attentively. This is challenging for children unused to structure of a school environment. The children loved performing! Their efforts attracted many curious on-lookers. Anne taught the children skills in colour mixing and using various drawing and painting materials. Restricting the colour palette to either warm or cool colours brought a vibrancy to the young creators’ paintings that came as a big surprise to all. This method of training develops skills in using paint to create a myriad of colours; drawing skills teach observation. All aspects of the visual arts teaches concentration. The children were extremely keen learners – they arrived on time, and tried their best to achieve the goals we set for them and to overcome the many compounding difficulties they have due to a lack of continuous and good education, as well as very hard family lives. It was clear to us how the Unatti Girls at the Home – who also had similarly difficult backgrounds – flourish when the basics of home, care and good education are in place. On the final day of the art and drama program, we were surprised by about 30 extra children turning up! A challenge for us in this tiny little space. We moved the program out into the community square where the children who had been attending throughout the week performed for the new students as well as many residents of this quarter of Bhaktapur. There are moments which are difficult – such as dealing with children’s lack of social skills combined with their need for the basics of life. 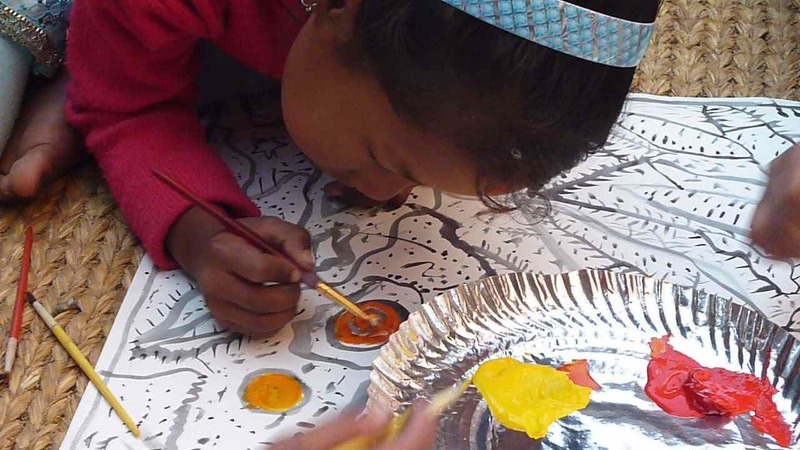 Nonetheless, the children’s perseverance led to some beautiful artworks and some fun performances. As we worked with the children we expanded their English vocabulary and they taught us a few Nepali words. Back to the Unatti Girls Home. We enjoyed spending a long Saturday afternoon with this group of 18 girls – ranging in age from about 4-16. We pitched this creative afternoon differently from the weeklong program as so much more was in place – such as a strong sense of community and much co-operation between the girls. Their quality education, together with the care of the house-mothers, meant that we could take them a lot further creatively in a much shorter time. Alex developed group projects – which were hilarious. Skits incorporated aspects of the girls’ daily lives as the ridiculous! A watercolour and drawing project brought attention to aspects of Australian Aboriginal X-ray style paintings. The inside-outside aspect of this work is great to stretch imaginations in how we think about expressing the body. We left as the night fell over Bhaktapur and the girls showed as a few sights of this beautiful and surprising town. Our time with Unatti was productive, special and rewarding. It was also a revealing glimpse into aspects of life in Nepal and the very great needs here. We were warmly welcome and cared for by Ramesh, and the teachers and housemothers who supported our visit. We appreciated the faith that Stephanie and Mai Lai had in us to conduct a worthwhile program for their foundation. We feel sure that we left behind students with more skills and experiences in art and drama and a little more self-confidence, and we intend to come back.